It is well known, that the French have a great cooking style, and one of their “secrets“ is their use of fresh herbs, to bring great flavor in to the dishes. There are three famous French herb mixes, fines herbes, bouquet garni, herbes de Provence. As the name may suggest, fines herbes, is the most fine and delicate of them since its flavor is mild and subtle and is often used egg dishes, on poultry and in salads. Bouquet garni is the most traditional of the three, often used in soups, stews and braises, because the herbs used in this one creates a great base flavor to your dish. Lastly, herbes de Provence, maybe the most well known of them and definitely the most powerful. This one is similar to the Italian herb mix, which actually makes sense considering the geographical proximity of Provence to Italy. This mix is often used as a rub for meats, when grilled and roasted, for seafood and in vegetable dishes. Because of the similarities in ingredients to the Italian mix, you may actually use it for Italian dishes, just add some oregano to it. Have a look at the recipes here and try them out. Ever seen a beautiful roast out of a southern barbecue all black? Nope, it was not burned, it was a delicious blackening seasoning. In fact, is was the spice called Cajun, named after the French colonist settled in Mississippi. It is a mixture of paprika, garlic, thyme, oregano and a mixture of black and cayenne pepper. Usually it is used as a rub for fish or meat and then fried on the pan and grilled until “the blackening” takes place. Rather than actually being burned, it is the paprika that turns black when seared. This blend can be made as spice as you like, depending on the amount of cayenne used, however if you are planning on using it for fish, remember that fish is a delicate thing and you do not want to ruin its natural flavor. Five-spice is a mixture of five, or more, spices, commonly used in the Chinese kitchen. The classic Chinese mixture is used to season fat meats, like duck and char siu (Chinese barbecue pork) for roasting and stir-frying. This blend creates a base for the meat with a deep and spicy flavor with a hint a sweetness, like a classical Asian dish. A standard five-spice blend includes star anise, cinnamon, cloves, Sichuan peppers and fennel seeds, but as mentioned it may contain even more spices and herbs, depending on your taste. This is a popular seafood seasoning first made in the Chesapeake Bay in the beginning of the 20th century. This seasoning may often be used for seafood, but because of its mildness, it is also a great mix as an all-purpose seasoning to use for eggs, mixed root vegetables, chicken, French fries and the list goes on. This seasoning includes celery seed, bay leaf, pepper, cloves, cinnamon, nutmeg, cardamom, mace, ginger, mustard, and paprika. Whether fresh herbs are used by a pinch or a bunch, it may infuse your dish with amazing flavors and aromas. Herbs can round dishes of and many herbs compliments other ingredients better than anything else, like basil and tomatoes. The basil leaves might as well just grow directly on the tomato plant. Of cause herbs fresh from your garden, directly cut from the plant is preferred, since you know how it is grown and it often has a lot more flavor than the ones you buy from the grocer. But not everyone is so lucky to have their own garden, and that is why we are able to buy fresh, cut herbs at the grocer. Most of the herbs from the grocer is produced by professional companies , and is hence alright to use and will have all the needed flavor. Though there are some you need to be vary about, like tarragon, this one may have close to zero flavor when packed in a plastic bag, so have taste before buying cut herbs. In French cuisine are three fine herb blends, read about French herb mixes and recipes for it. When getting in to fresh herbs, we can split them in 2 categories that can help us in the way we are supposed to use them. The 2 types is soft and hard herbs. In this article we will be focusing on 2 soft and 2 hard, basil, tarragon, rosemary and thyme. All of those comes in many different flavors and colors, but we will be taking on the most common of them. Soft herbs are characterized by not growing on twigs, like parsley and basil. When using these, it is very important to know, that they will loose their potency when heated. Use these by adding them at the end of cooking the dish and in cold dishes, like a salad. So when baking the delicious pizza margherita, add the basil leaves after baking the pizza. It will both look and taste way better. These are almost completely opposite of the soft ones, the way they are used and the way they are grown. Hard herbs are growing on twigs and can be used in cooking that need heat, these may be rosemary and thyme. Rosemary for example, is great when cooking a steak. Add is to the pan along with butter and some garlic and thyme is great for a roast chicken. 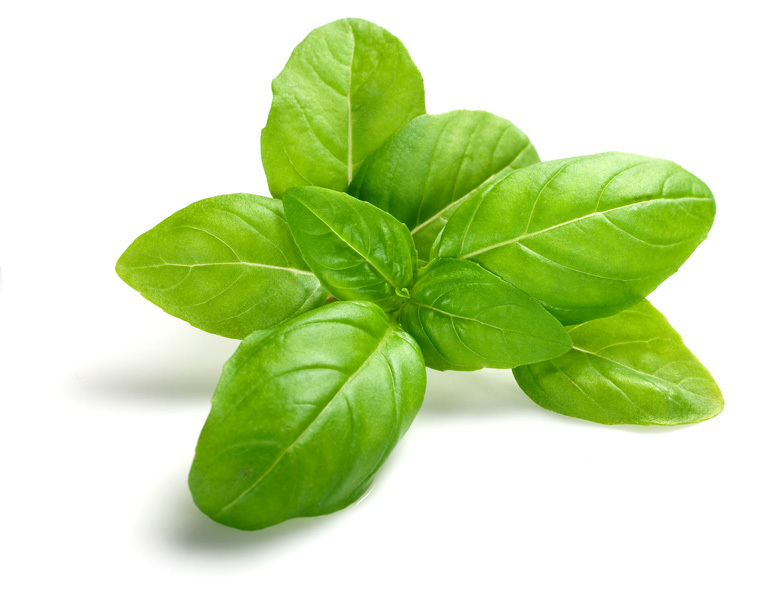 Basil may be the most used and most important herb in the culinary world. If a kitchen only has a few fresh herbs in its possession, basil may very well be one of them. It is very fragrant and have a wonderful powerful taste. in every form, if handled correctly. Like many other plants, basil comes in a load of variations with Basil have a slight taste of anis, that smells and tastes something like licorice. Hence making it a great match for fish, cheese, soups and eggs. Because of its powerful flavor, even a few leaves may transform a simple dish into a potent mouthful. It too combines very well with other fresh herbs like rosemary and thyme. But remember only to add it in the end, so it won’t lose its flavor. Tarragon, also known as estragon, is a leafy green herb often used in the French kitchen and a part of the fines herbes, a special seasoning mix. It has a very special flavor, very powerful, and is considered a love or hate herb, because of the of its distinguished taste. This too comes in a variety of species, from the well-known rather small, aromatic and flavorsome French one to Russian version that may grow over a meter tall and is considered useless in the culinary world, because of its lack of taste. Fresh tarragon sprouts in spring and summer, making it a seasonal herb. You may of cause buy it in twigs from your grocer, but be vary about the taste, it may not contain any. It is particularly good for vinaigrette, and of cause, the sauce bearnaise. Originally grown in the Mediterranean regions, this wooden herb with a fragrance of citrus and a faint smell of lavender, this may be the most versatile herb of all. Because of the pine needle like leaves if can be used in almost every form of cooking. 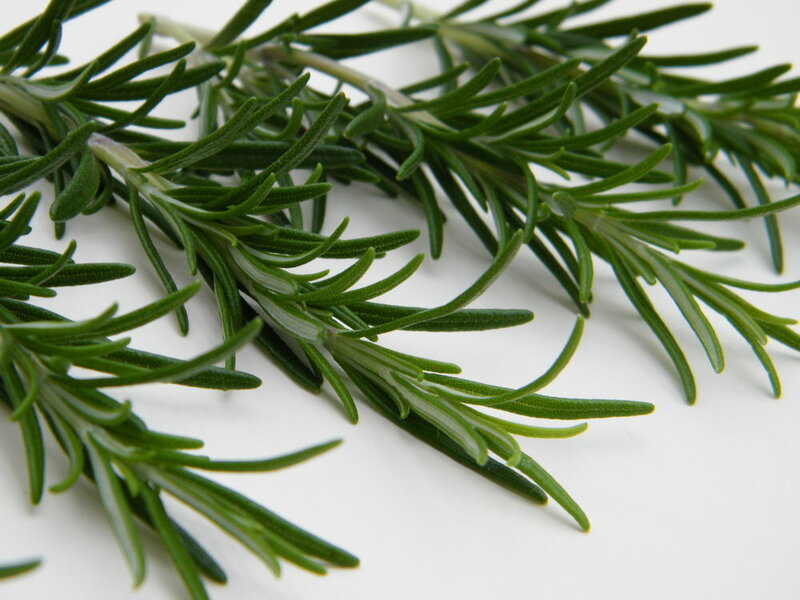 Rosemary is great when cooking a steak, roast, soup and pretty much everything that cooks in the oven. It too is easy to keep, because of its “hardy” looks, it can grow almost everywhere, in the garden or in the kitchen, and does not require a lot to maintain. A splash of water a couple of times a week and placed as light as possible, and you will have a fresh herb at hand for a long time. If it grows too wild, cut some of and dry it, even though it will lose some flavor, it will still taste wonderful. Part of the mint family and maybe the herb with the most variations in the world as it comes in as many as 350 different species. It can be bush-like or low growing, with leaves varying in all variations of green and some of them have white and pink flowers. Thyme may have scent and flavor of pine, lemon, camphor and eucalyptus, depending on where it is grown and in which variation. Most of those used for cooking originates in southern Europe and western Asia but is now grown all over the world. It may be used both fresh and dried, and as with rosemary the fresh thyme is both when fresh. Also, this herb may grow everywhere and, in all weather, even snow if you grow it in the garden. 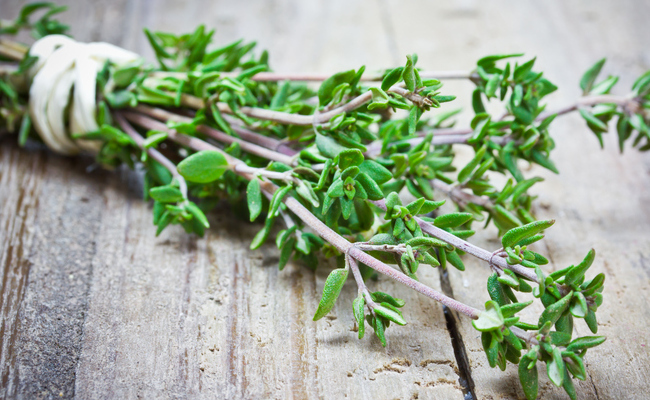 Thyme is great for soup, stock, stew and roasting. Thyme is a part of the bouquet garni.